DJ Weimer developed a love for the agricultural community as a child, growing up on a family farm in the Knightstown area. Meanwhile, Sarah Weimer was living in Long Island, New York, helping her equine veterinarian father at thoroughbred racetracks. The two met in veterinary school at Purdue. While DJ’s roots were clearly in Henry County, Sarah discovered that her great-great grandfather served in the Civil War and was from Henry County also. It made sense that the two would make their new beginning together in Henry County. After graduation, DJ worked as a large animal veterinarian while Sarah worked for other veterinary offices in the region. Their dream, however, was to open a small-town veterinary clinic. 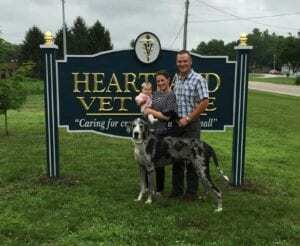 That dream became reality in June of 2018, when they opened Heartland Vet Care in Knightstown. Heartland is located in a large renovated farmhouse not far from Knightstown Elementary School. The clinic’s motto, “Caring for Creatures Great and Small,” identifies the broad scope of the practice, which includes dogs, cats, some exotic creatures, along with cattle. DJ and Sarah enjoy connecting with both animals and the people who own them. DJ has a passion for helping farmers stay as productive and profitable as possible. He’s almost always accompanied by Walter, a Mantle Merle Great Dane and the clinic’s official mascot. DJ always knew he wanted to live in a small town. “I like small town life and staying closer to family. There are many benefits of being involved in the community,” he said. They both appreciate what Indiana has to offer, especially in terms of an affordable cost of living and the agricultural focus of the state. They also appreciate the sense of community that comes with living in a small town. The Weimers have chosen to forgo the life lived at stoplights, a decision that means even more to them as they raise their daughter Charlotte close to family and in a friendly small town. Sarah treats our black lab and we absolutely love the care and compassion Sarah provides for our pet. She has been treating Kiska since before they opened their own clinic. We are extremely excited about the new clinic and overwhelmingly trust Sarah to take care of our Kiska. The best of care, right in our own town. Thanks to Sarah and DJ for their commitment to the community.